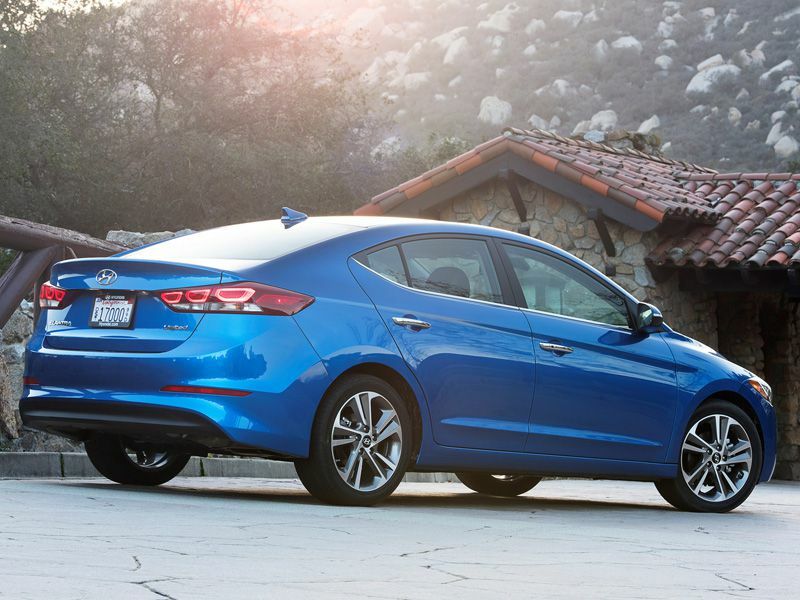 Describing the redesigned 2017 Hyundai Elantra in a single word is easy: impressive. 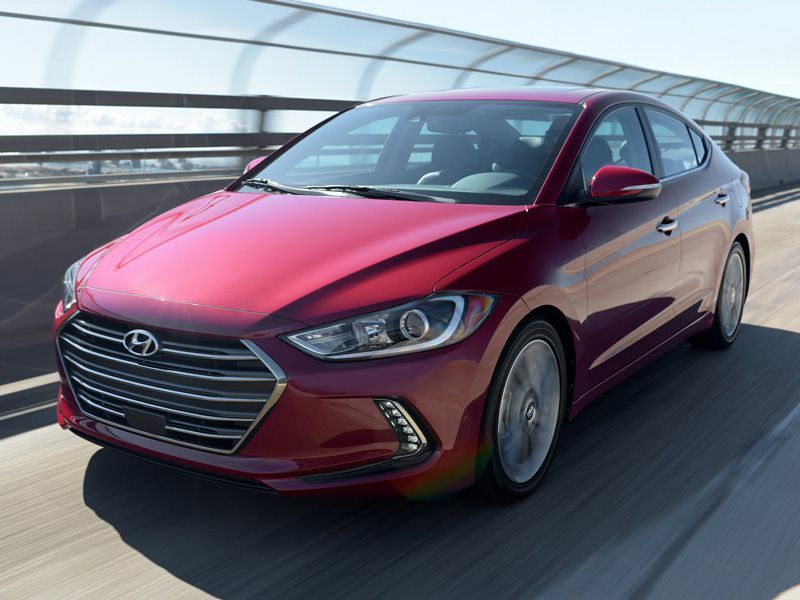 From its refined and grown-up exterior styling to its better-behaved driving dynamics, the new Elantra is worthy of consideration by anyone shopping for a compact, 4-door sedan. On the pages that follow, we’ll go into deeper depth about the 10 things you need to know about the all-new 2017 Elantra. 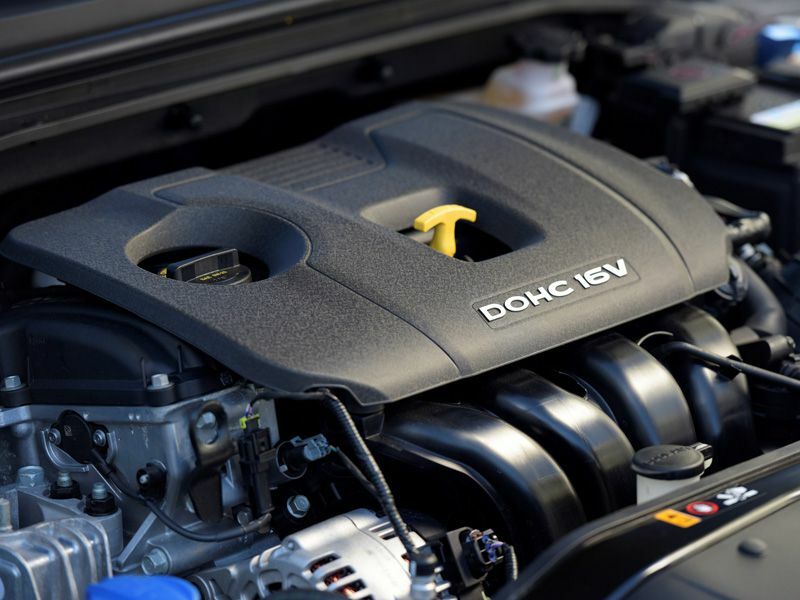 Think about this for a moment: Hyundai introduced its 10-year/100,000-mile powertrain warranty more than 15 years ago, and the company hasn’t come anywhere near going bankrupt. Clearly, Hyundais, including the new Elantra, are built to last. By offering industry-leading warranty protection, and by earning top quality ratings, Hyundai has clearly demonstrated that it builds dependable vehicles. 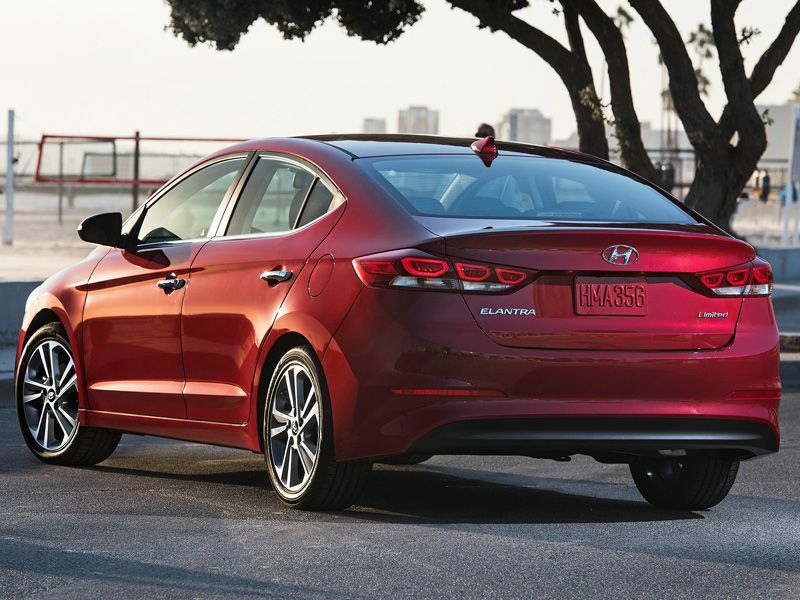 With its redesign for 2017, the Elantra grows up. 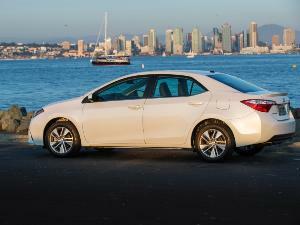 Though attractive, the previous Elantra expressed cartoonish curves, swells, and bulges. Cleaner, toned flanks give the new 2017 Elantra a more mature and grown-up appearance, drawing inspiration from the Genesis luxury sedan. Aerodynamics also played a role in the more conservative appearance, and Hyundai says the car’s coefficient of drag is reduced to 0.27. Oddly, though, EPA fuel economy ratings are slightly lower than the previous model. Choose the Limited trim level for a full set of LED lighting elements including the running lights, taillights, and turn signal indicators in the side mirror housings. An upscale touch, LED lighting also illuminates the Elantra Limited model’s door handles at night. About the same size as it was before, the new Elantra is rated as a midsize car by the EPA. 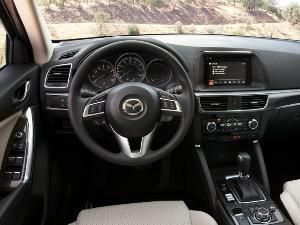 It offers plenty of room for four adults, and the front seats adjust to fit a wide range of body types. Hyundai also took steps to quiet the car’s interior, and based on a daylong drive, the measures are effective at reducing cabin noise. 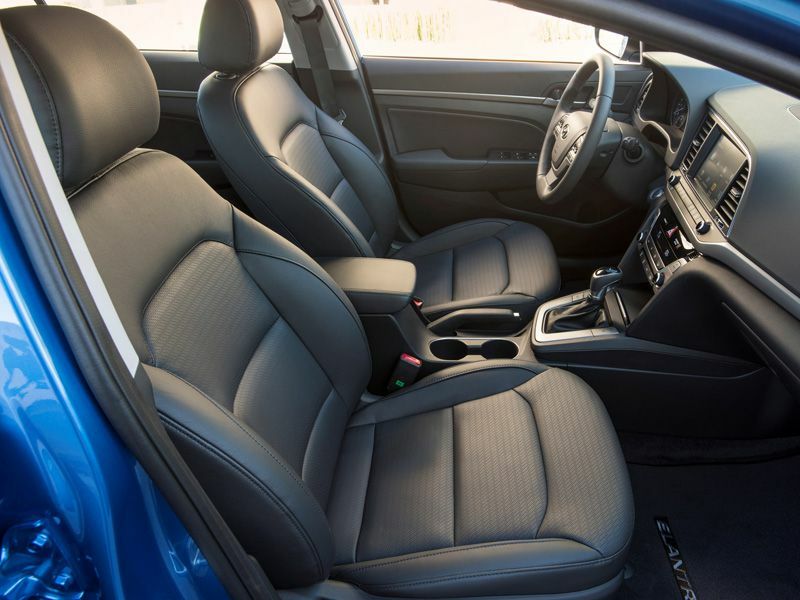 As a part of the redesign, the new Elantra’s seat frames are designed to help limit injury in certain types of collisions, and multi-firmness, soy-based seat padding is expected to improve long-distance comfort. 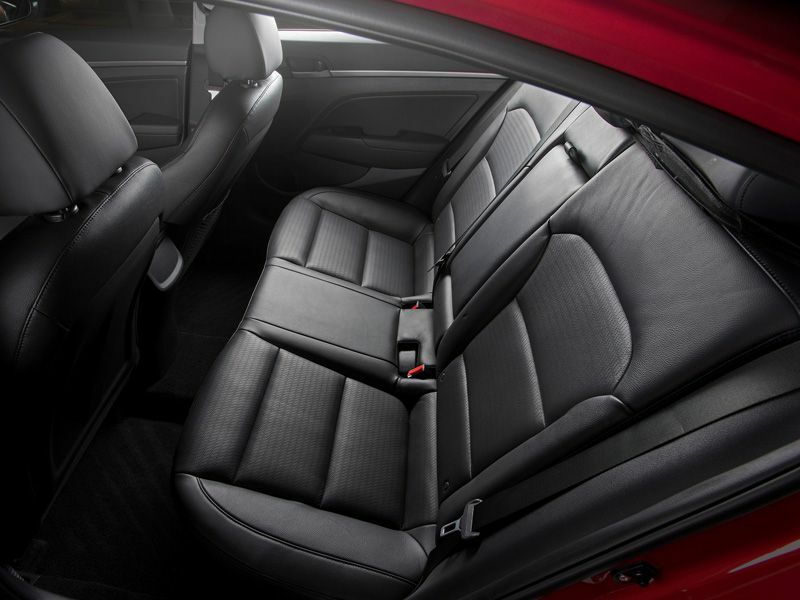 Standard front seat height adjusters can provide higher seating hip points, making the Elantra easier to get into and out of. The Elantra’s trunk is smaller than last year, but still offers 14.2 cu.-ft. of space combined with a wider opening that makes it easier to use. An available Smart Trunk feature pops the trunk when it senses the Proximity Key fob near the rear of the vehicle. Install the optional Popular Equipment Package on the Elantra SE, or choose the Elantra Limited, and the car is equipped with a touchscreen infotainment system that includes a 7-inch display, Siri Eyes Free, and Apple CarPlay and Android Auto smartphone projection technology. Connect your device using the extra USB port, and the display screen resembles your smartphone, making it easier to find and use supported applications. Optional for the Elantra Limited, an upgraded version of the infotainment system includes a larger 8-inch display, a navigation system, and an Infinity premium sound system with Clari-Fi music restoration technology. It sounds terrific whether you’re listening to alternative rock or an orchestra. Hyundai’s Blue Link subscription services technology is available through either of the Elantra’s infotainment systems. The basic package includes free access to automatic collision notification and SOS emergency calling for the first year of ownership. An upgrade package adds useful features for when a teenaged driver is using the Elantra, including programmable alerts related to vehicle speed, curfew, and geographic boundaries. A car finder service allows a parent to locate the Elantra at any time. 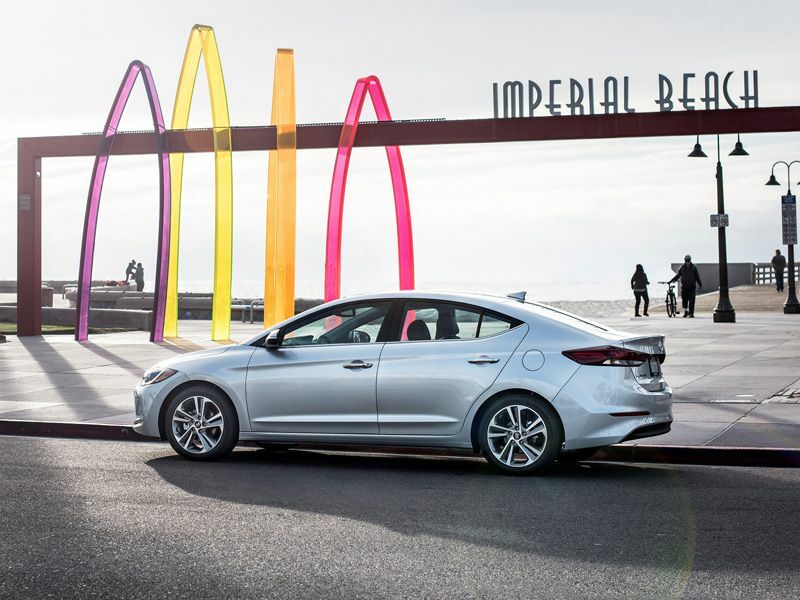 Additionally, 53 percent of the new Elantra’s underlying architecture is comprised of high-strength steel with the goal of earning top crash-test ratings from the federal government and the Insurance Institute for Highway Safety. A blind spot warning system with lane change assist and rear cross-traffic alert is optional for the SE and standard for the Limited, while Limited models can be further fitted with a lane departure warning system, a lane keeping assist system, forward collision warning with pedestrian detection, and an automatic emergency braking system. 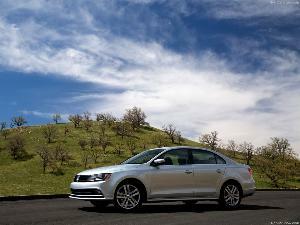 A new, Atkinson-cycle, 2.0-liter 4-cylinder engine makes 147 horsepower at 6,200 rpm and 132 lb.-ft. of torque at 4,500 rpm. 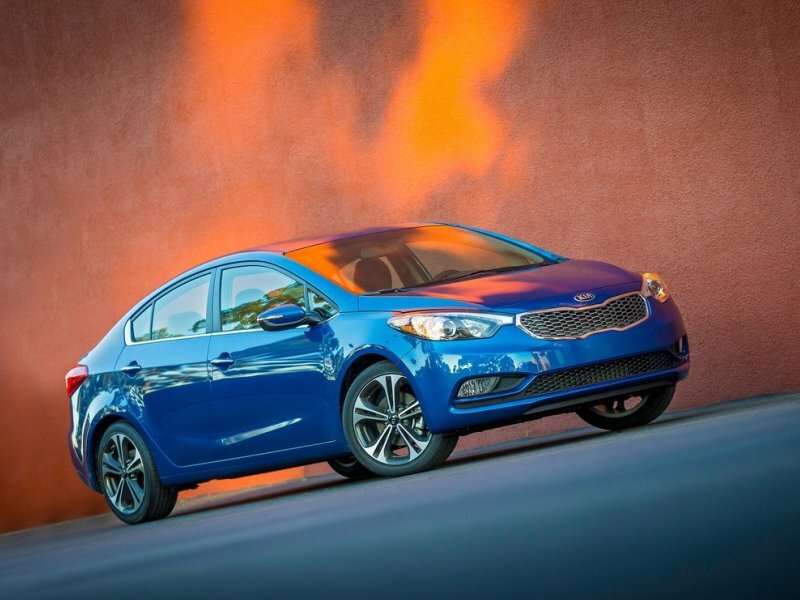 This larger displacement engine is only slightly stronger than last year’s 1.8-liter 4-cylinder, and the car weighs about the same, so don’t expect big differences in outright acceleration. 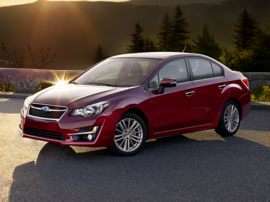 Instead, this new engine is more refined, and versions with the 6-speed automatic transmission gain a new Sport driving mode designed to provide peppier performance. A 6-speed manual gearbox is offered only for the most basic SE models. Oddly, the new engine is not more fuel-efficient. 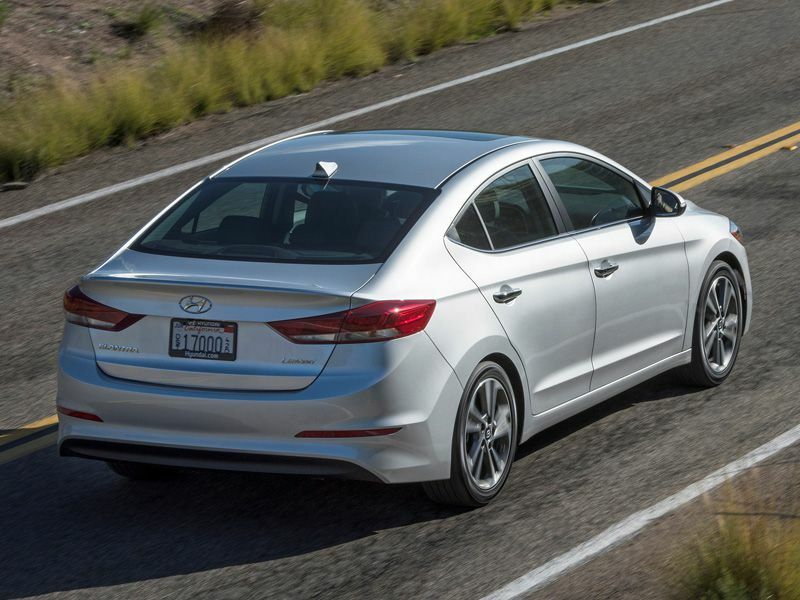 Even stranger, it is the highway mileage ratings that drop, despite the Elantra’s improved aerodynamics. In combined driving, the Elantra with an automatic transmission is EPA-rated to return 32 mpg in combined driving, the same as last year. If gas mileage is important to you, wait for the Elantra Eco model, which will have a turbocharged 1.4-liter 4-cylinder engine, will make more torque at lower engine rpm, and is projected to get 35 mpg in combined driving compared to 32 mpg for the Elantra SE and Limited with an automatic transmission. It goes on sale by summer. In addition to its more rigid structure, which contributes to improved ride and handling, and the new Sport driving mode, which enlivens acceleration, the new Elantra’s electric steering and suspension tuning are modified to make the car more enjoyable to drive. Having spent a day behind the Elantra’s steering wheel traveling a variety of roads, the car’s single most significant dynamic improvement relates to the revised steering. 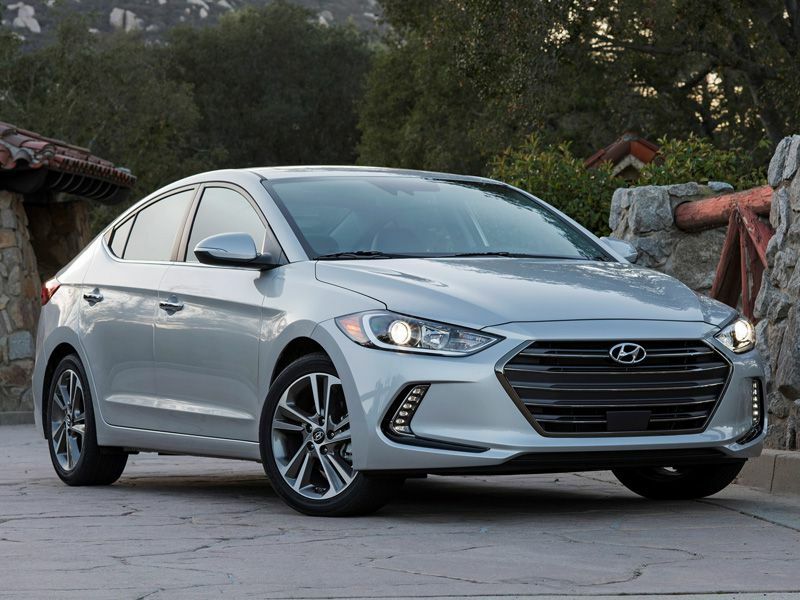 Better weighted and sharper than before, it draws far less attention to itself than what Hyundai used in the previous Elantra. The key is to shut the lane keeping assist technology off, which autonomously attempts to center the car in its lane. With that said, room for improvement remains. Right on center, the steering still feels a little bit vague and disconnected. Also, the car’s new Drive Mode Select technology can have a negative impact on the steering. Finally, what’s up with standard rear drum brakes for the SE models, Hyundai? Is this the 1980s? Drive Mode Select is new for the 2017 Elantra, supplying Active Eco, Normal, and Sport driving modes that adjust drivetrain and steering calibration. In Active Eco mode, the engine responds with the urgency of a sloth in order to conserve gas. In Sport mode, the Elantra feels peppy. As for the steering, it has a light and responsive feel in Active Eco and Normal modes, while Sport mode increases the amount of effort necessary to alter course without sharpening response. Genuinely, it is unfortunate that the Elantra’s owner can’t keep the steering in Normal mode while putting the powertrain in Sport mode. If you can operate a manual transmission and you don’t care about options, you can buy a basic Elantra SE for $17,985 (including the $835 destination charge). 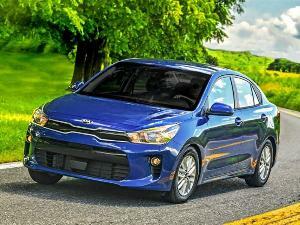 Add an automatic transmission ($1,000) and the Popular Equipment Package ($800) and you’ve got the car that Hyundai expects to be the most popular. For leather, upgraded trim, fancy 17-inch aluminum wheels, and more, choose the Elantra Limited ($23,185). Load this model up with all of the extras, and the price tops out at just over $28,000. For reference, that’s the same neighborhood where the larger Hyundai Sonata Limited starts. 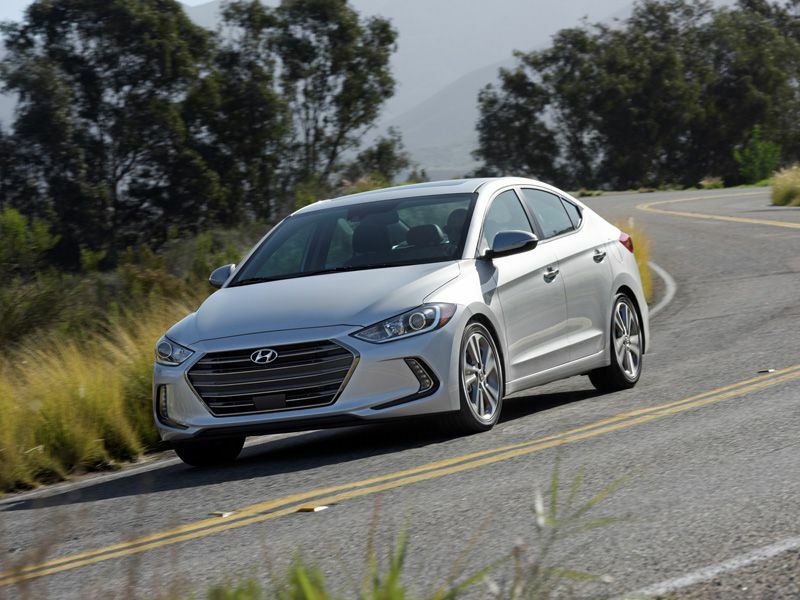 Half of the Elantras to be sold in the U.S. will be sourced from Hyundai’s Alabama assembly plant, and the other half will come from South Korea. The Elantra went on sale at the end of January of 2016, and the automaker expects no more than 25 percent of sales to be the Limited model.